Latest news from the Walker Family! 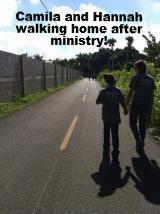 You can go to http://ywamorlando.com/staff/56-ywam-orlando-staff/53-nwalker to donate to the Walker Family. Adjusting Well to the Dominican Republic! A picture with our Spanish teacher, Guarionex, aka. Professor X! We are doing well! We are busy with Spanish classes four days a week two hours a day. Last week we worked with a group called Chapel Project, so we did not have class but instead put what we had learned to use. 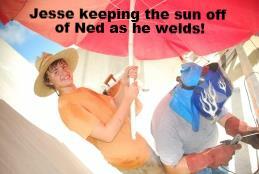 Ned and Jesse were surprised at how much they understood. They are still struggling with remembering the right word to speak but that comes after understanding or so we are told. We attend a Spanish speaking church called Oasis and are beginning to make some friends there. Mainly Spanish speakers but some who speak English too which is nice. We enjoy going over to Casa Grande, a local ministry here run by Tim and Trena Johnson. Their son Darren is a good friend to the kids. Please pray for Darren as he is still currently in the hospital with complications from dengue fever. Prayerfully he will get to come home tomorrow. We have gone to visit him a couple of times to break his boredom. We made a trip to Santo Domingo to visit the national directors here in the country. It is about a 2 hour drive but was a nice visit with the Norells and Sanders. We are hoping to get to go to Haiti around Christmas to visit Thom (Debbie's brother) and family who are missionaries there. Please pray for the funds for this trip! It will be about $125 each with transportation and border crossing fees. Occupancy!! As you know, we are launched out of YWAM Orlando where we have served for the past 5 years. They still process our funds and are a great support for us. We, here at YWAM Santiago, were excited to get to celebrate with YWAM Orlando via livestream internet on September 27 when they finally after 3+ years were able to get the occupancy on some of the buildings. The current fall schools are living in the dorms! And can have class in the air-conditioned buildings!! No more army tent classrooms! God is sooo good! We miss all of our friends at YWAM Orlando who are much more like family than friends. We are praying that they will be able to continue to send teams here and build the connection between them and us. Looking forward to hosting teams from Orlando very soon! It was quite the crazy month with Ned, Debbie and Jesse all having chest x-rays done and having fluid in the lungs. We have all struggled with bronchitis and issues. Some worse than others. Ned scared the doctor quite a bit because his chest x-ray showed an enlarged heart. They were quite worried and rushed around getting us to have blood work, EKG, echocardiogram and other various tests. Ned's blood pressure, cholesterol and uric acids were all very high but the echocardiogram showed that his heart was not as bad as it first seemed. Ned is now on cholesterol and bp meds and is trying hard to loose weight. Quite the task in a rice and beans and bread country where relationships are incredibly important and often involve food. We were super blessed to not have to pay for the doctor's visits just some of the tests. The doctor is a good friend's dad and he has been quite the blessing and brings us star fruit and plantains to help us be healthy. Thanks for your prayers for health for us all but especially Ned. 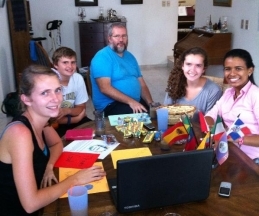 Helping to build churches alongside Dominicans! This past week we were privileged to work with Chapel Project for the second time. Chapel Project helps to build a roof on a church building that the locals have constructed the walls on. The pastor and church must raise a certain amount of money and do a certain amount of work in order to be helped. There is a screening process that the church must go through also. Sometimes helping hurts....this is a lesson that the Dominican Republic and Haiti missionaries are learning from the past. A hand-out is not always the best thing for someone, but if that person can work alongside the missionary there is "sweat equity" and an ownership in what is being done. Sometimes a blessing is needed and sometimes a work project is better. 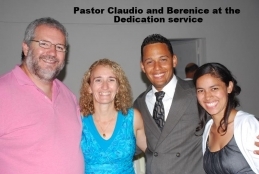 This past week we were able to help build Iglesia Cristiana with Claudio and Berenice Moncion! They are some of the sweetest people I have ever met with an amazing heart for the people they meet to grow in their relationship with God. It was a blessing to work with our friends with Chapel Project. Don MacCaugly is a true inspiration, having built chapels in Romania for years and now working on them here in the DR. Ned welded for the first time in over 20 years and Jesse was able to get to work. 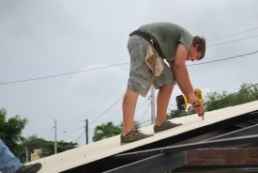 He was on the roof and helping to screw the sheet metal roof pieces to the trusses and pearlings. Debbie oversaw snacks and lunch and Sammi and Hannah were part of the street evangelism team that went out daily building the "church". What a blessing to be a part of what God is doing here! Giving Dominicans a boost and encouragement as they minister to their own people! We have enjoyed working at NIKOland up in the mountains outside of Santiago. We hosted a local pastor and missionary who has worked with YWAM Santo Domingo before. We along with Juan, who works with us part-time, went up and worked cutting out guava trees. Guava trees will quickly overtake the land as the fruit is plentiful and drops with lots and lots of seeds! The pastor and missionary worked so hard with us that day and then prayed a sweet blessing over our family before they had to leave. Sadly, the only pictures I got were too far off to show up well in the newsletter. Funny story for you! The neighbors, with our permission, allow their cows to graze on the land. When we were working here last spring the gates were not finished and so the cows were normally tied or would not leave due to barb wire. WELL, now the gates are finished and look great. They work great IF you close them...well we didn't! We went to leave and the two cows and horse that had been peacefully grazing were gone! YEP, down the road somewhere. I had to go and tell the neighbors that their cows were gone. With my limited Spanish, I told them that the "vacas dice adios gringos"...yes, that means cows said good bye gringos. They laughed and said the boys would have something to do after school. Well, the next week there were 10 cows grazing. I guess they weren't upset. Here is a pic of Hannah, Sammi and Jesse and of course Riza watching the cows! Trying to get them to come close enough to pet them. * Housing! When the Martin's return in January we will need to move out of their home. We are currently looking around for a place to go. We would love to find a large home with a bit of a yard in order to house teams better than the current house which houses about 20 and is in a close neighborhood. Wisdom as we look and affordable prices. * Language Learning! Continued learning and creativity within our learning styles. Also for the funds for the lessons. * Sammi, Hannah & Jesse. God is providing some friends from past trips for the kids. Prayers that they continue to make friends and adjust. * Finances.. A few more monthly supporters are needed. Funds for the needed misc. things to move for daily life. Funds for the first, last, security deposit for a home to move into and the furniture needed. Fridge, stove, inverter, washer, etc...are NOT included in a home when renting or buying here...so funds for these things. *Safety and Adjustment.. We are adjusting well to life here which includes heat, noise, locks, alarms, etc... We are beginning to miss home and family and friends. Would you like to Skype with us? neddeb.walker is our Skype name. Chatting with friends and family from home helps a lot! King's Kids is a YWAM program that has been around for years allowing kids aged anywhere from 6 on up to minister. Here at YWAM Santiago we have a week long camp and then once a month, the kids get together and have a teaching about a characteristic of God and then go do ministry together. They learn dances and dramas and use these along with their personal testimonies to share the love of God with others. Dominican kids sharing the love of Jesus and His Salvation with other Dominicans. We walked to a neighborhood "barrio" about 15 minutes from the mission's house and did a street performance and then prayed for the people who came to watch. What a great time serving God with these great kids. Each night we ask the kids how they brought joy to God's heart that day. Camila answered that she did her cleaning chore well and that she loved her Hannah! She was right! When we love others, even in the simplest ways, this brings joy to God's heart. This Christian walk is about just that...loving others and showing them God's love!